Freshmen pack the October session of Citizenship@Mizzou, a new requirement for incoming students. Faculty members Nathan Hofer, Andrew Hoberek, Elisa Glick and Urmeka Jefferson lead the discussion, which is moderated by professor Stephanie Shonekan. The most recent session served as a makeup for students who missed the August orientation events. Nathan Hofer throws out a question to the sea of fresh undergraduates. Does religion cause violence? The roughly 1,500 people crowding into Jesse Auditorium are days away from taking their first college class. They’re sitting here for a mandatory orientation program. They don’t know Hofer. They don’t know their fellow students. Yet they’re being asked to share their personal thoughts on a hot-button issue. Good, says Hofer, an assistant professor of religious studies. But he knows she doesn’t speak for everyone. Who disagrees? he asks. The crowd immediately reacts. A rumble starts to build. The student persists. I don’t see any terrorist Methodists out there, he says. Now the rumble turns to a roar. Students jump out of their seats. “What about the Baptist church?” someone shouts. Hofer stands on stage, smiling. “I love this. This is so productive,” he says. Universities across the country are wrestling with how to set students’ expectations about what the college experience is; where the lines are that separate free speech, respect, safety and academic freedom; and what happens when one person’s freedom of speech violates another’s sense of respect. Mizzou chose to address the conundrum not through a letter to incoming students or an online training video. The student band Talking Drum performs songs such as "Imagine" and "Blowin' in the Wind" in various musical styles to spark discussion among students in the audience. 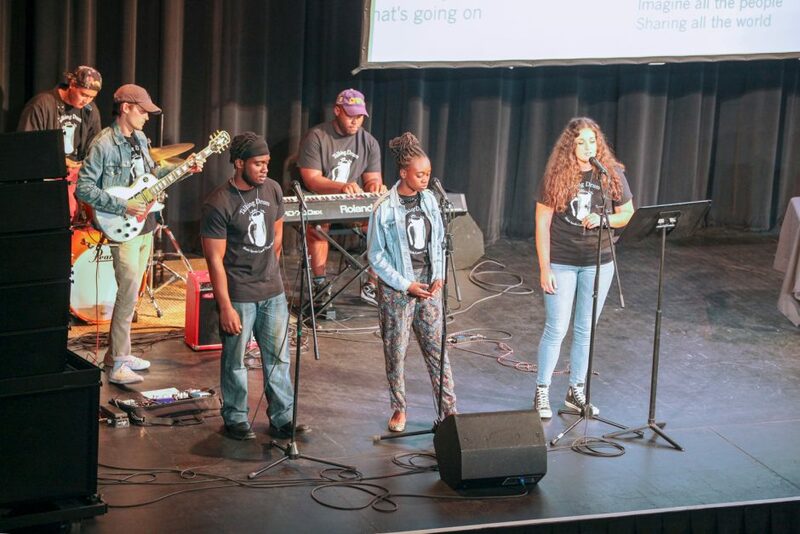 Band members include (clockwise from back left) drummer Jacob Somerscales; keyboardist Doug Blakely; vocalists Amanda Bongiovanni, Kennedy Moore and Kenyatta Woods; and guitarist Zach Zito. The idea for Citizenship@Mizzou arose from the race relation forums former Chancellor R. Bowen Loftin held in fall 2015. At one session, Loftin said he wanted to create a diversity training course for all incoming students. That got the attention of Stephanie Shonekan, chair of the Department of Black Studies, and Joan Hermsen, chair of the Department of Women’s and Gender Studies, who asked to be involved. Eventually the pair was given full authority to create a program for new students, to be rolled out for the spring 2016 semester. Going in, they knew one thing for sure: Whatever they did would be face-to-face, not online. They also knew they wanted to involve faculty. They ended up with a panel discussion featuring seven faculty members called Diversity@Mizzou: A Taste of Things to Come. The sessions went OK, but after receiving feedback from students, Shonekan realized that both the name and the format needed a facelift for the fall semester. So, based on a student suggestion, they changed the name to Citizenship@Mizzou, which was less weighted and a more accurate reflection of the broader themes they wanted to discuss — namely, what being a good citizen of the Mizzou community really means. But more important, there was a shift in approach, from information giving to conversation starting. Shonekan cut the number of faculty speakers from seven to four and added Talking Drum, a group of Shonekan’s former students who formed a band during the spring 2016 semester. Capitalizing on music as an ice breaker, she decided to give the band the first exercise in the revamped session. She would have them perform Bob Dylan’s “Blowin’ in the Wind” in three different styles — folk, R&B and pop — and ask students which style they preferred and then lead them to realize that we’re all most comfortable with what’s familiar but that there’s value and excitement in what’s new. The four professors — Urmeka Jefferson (nursing), Andrew Hoberek (English), Elisa Glick (English and women’s and gender studies) and Hofer — decided they would each craft a presentation around one of Mizzou’s four core values: respect, responsibility, discovery and excellence. They would tell personal stories of how they put the value into practice. They would end each story with a question and give the students the opportunity to talk about their interpretation of Mizzou’s values. Then they crossed their fingers. The number of new students in the spring semester is fairly small, and the sessions fit easily into lecture halls on campus. 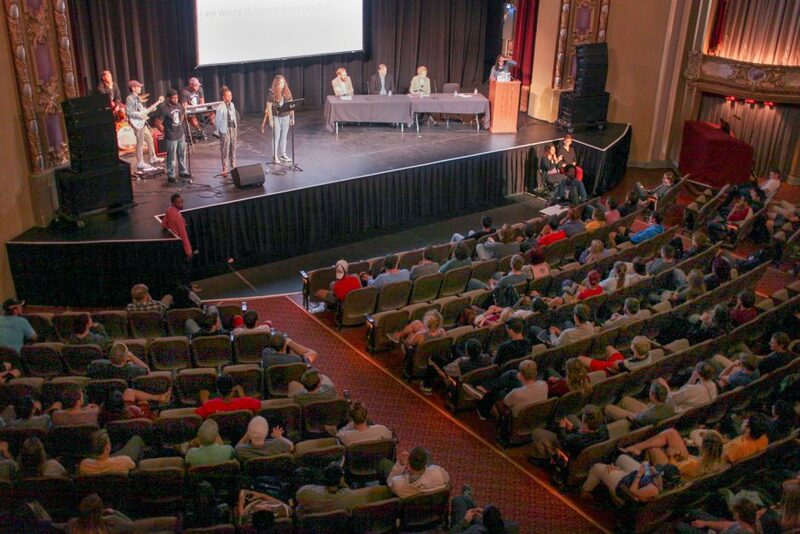 For fall, students filled Jesse Auditorium. If the new program failed, it would fail big. Shonekan walked onto the stage for the first session, unsure whether the students would stare at their phones for two hours or actually engage with the program. She introduced herself, the professors and the band, who played “Blowin’ in the Wind.” Then she asked for students to share which version they liked. For a fast second, nothing happened. Then a hand shot up. Then another. And another. Students took the microphone and shared their preference. Others shared amongst themselves. They were engaged. Student response has been positive — and not always in ways the organizers expected. During her presentation, Glick spoke about how her family had disowned her after she came out as gay. After one of the sessions, a young white girl approached her and asked to talk. “Her boyfriend was black, and she was afraid of being disowned and was really struggling,” Glick says. Because Glick had been vulnerable with her story on stage, the student felt safe talking to her about her own situation. They went back to Glick’s office and talked for an hour. “I felt like I was really able to help her,” Glick says. Students also liked the new changes — namely the music. The incoming students also appreciated the faculty’s openness regarding what happened on campus last fall. “I was coming into Mizzou expecting a lot of tension, but the fact they acknowledged it and said they were working on it made me feel more secure,” says Adil Shah, 18, of Creve Coeur, Missouri. But there are still points for improvement. Especially among those who attended the session that had the row over Islam and violence, students expressed a wish for more dialogue. That’s something Shonekan and the four professors are already talking about. "I came in here thinking I was going to hate this, and I didn’t." It was that new focus that the fall sessions brought — sparking student conversation — that proved most successful. In a year as politically divisive as 2016, perhaps the best evidence that Citizenship@Mizzou succeeded in that aim was an interaction Shonekan had with a student after one of the sessions.